HOW DO YOU BECOME A MAN? BY LIVING LIKE JESUS. How To Be A Man: Pursuing Christ-centered Masculinity [Student Edition] is a 40-day devotional experience that will challenge teenage guys to a more passionate pursuit of growing in to the man God is calling them to be. Turn this devotional experience into a small group Bible Study. Click here for details! Culture sends so many confusing messages about masculinity, and when you add faith to the mix, it gets even more complicated. What does it mean to be a man, anyway? And more importantly, what does it mean to be a teenage guy who seeks to become the young man God wants him to be? HOW DO YOU BECOME A MAN? BY LIVING LIKE JESUS. Using 8 core characteristics, this devotional experience will challenge teenage guys to exemplify these in their own lives as they passionately pursue a Christ-centered manhood. Download our How to Be a Man Challenge Study Guide for leading teenagers into a meaningful experience of becoming the man God is calling them to be. TO DOWNLOAD THE STUDY GUIDE, CLICK HERE. You'll need a copy of the Student Edition for each guy and a copy of How to Be a Man for each Adult Leader. Look below for our Bundle option to pick up bulk copies! Download this sample and check out the incredible content included in the HOW TO BE A MAN [Student Edition] 8-week devotional experience. 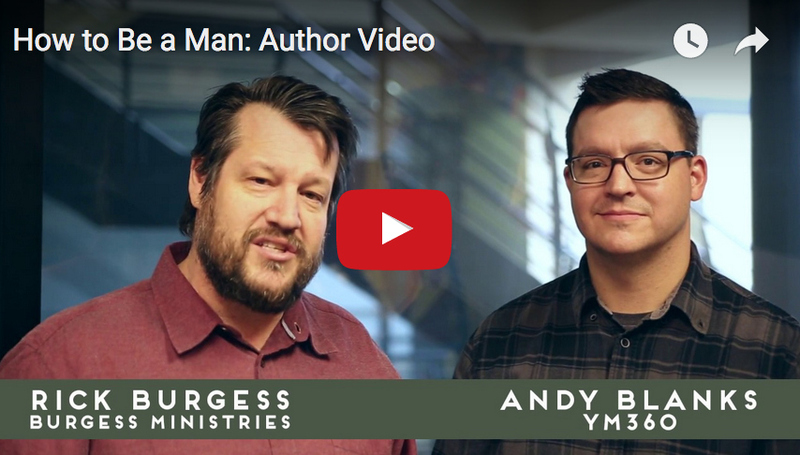 Rick Burgess and Andy Blanks, co-authors of How to Be a Man: Pursuing Christ-centered Masculinity, share their heart behind creating these resources. Download this sample and check out the incredible content included in the HOW TO BE A MAN 8-week devotional experience. Grab a book for each Student and Adult Leader, download this free Bible study, and take discipling your teenage guys to the next level.